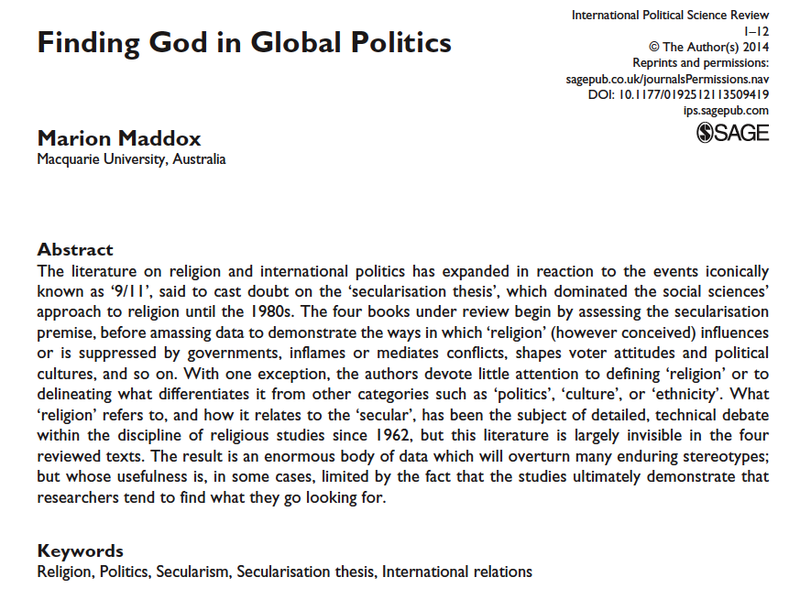 The Australian scholar, Marion Maddox, has written an interesting review essay for The International Political Science Review (get a free PDF of the article from the publisher here) documenting the lack of cross-disciplinary pollination when it comes to research on religion. As I’ve written on other occasions, when it comes to experts in other fields — sophisticated, often world-famous and much-quoted experts — they routinely revert to invoking nothing much more than a merely Sunday School level of expertise when they turn their attention to the topic of religion, making evident the widely held folk assumption that everyone’s an expert on this deeply personal set of beliefs about God (or however they opt to define it). Thanks to Steffen Führding for bringing this article to my attention. This entry was posted in Faculty Blog, Relevance of Humanities, Religion in Culture and tagged Cross-disciplinary, Marion Maddox, Political Science, Politics, Secular, Steffen Führding by Russell McCutcheon. Bookmark the permalink. Here’s the opportunity I’ve been looking for now for some time to bring critical religious studies into significant conversation with the social sciences! One way to move on this implicit invitation to engage would be for critically-minded religious studies types to take on prominent works by social scientists, in order to show how our critical work on the concept of religion makes a difference. We can talk all we want about “religion” critically, but until we show that the results of criticism actually change the outcomes of social science work, criticism remains a sterile effort. Concepts in the sciences are criticized for the practical purpose of being put to work in explaining & understanding things better than previous pre- critical concepts had. So happy that my work can create opportunities like this for others who wish to continue the conversation. Not quite, since I want to keep “religion” around, until shown useless, in contrast to heat I take your position to be. ,Wouldn’t it be better to join forces against those using “religion” UNcritically than to eliminate the term altogether? I think CogSci as well as PoliSci present rich fields of targets, for instance. There’s so much to do. I started that by taking on Robt Pape re suicide bombers in my Why Politcs Can’t Be Freed from Religion, as you may already know. I think what we need is concerted effort to expose the weaknesses of something mainline, like poli sci, or trendy, like CogSci, and show how a particular reformed notion of “religion” brings richer results than these pathetic efforts. PS. I should have said I see no pressing reason to eliminate the term, “religion”, not that I think it is vital by all means to keep it. Indeed, cog sci is a worthwhile target and I’ve taken aim at it and have moved on to other targets. I took aim at sociology of religion’s rational choice work as well, some years ago. So it would indeed be nice to see others pick up those gauntlets and run with them themselves, or whatever one does with a gauntlet, other than put it on or throw it down.